As you can imagine, I get tons and tons of beauty products (we’re talking several boxes a week). I spend several hours going through the products — testing, touching, trying on — classifying the products into categories (like / don’t like, want to wear right away / can wait). 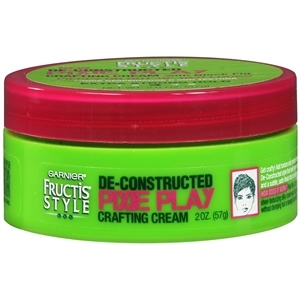 In one of my treasure trove boxes, I came across Garnier Fructis Style Deconstructed Pixie Play Craft Cream ($4.29). I cast it aside for a few days, making the mistake of thinking since the product had “Pixie” in the title it wouldn’t work for my long curly hair. I decided to test the Craft Cream on a day I wasn’t planning on leaving the house (Lesson #1: Always dress rehearsal new beauty products!). After I had applied leave-in conditioner, I opened the jar of product to find a surprisingly non-sticky cream. I took a quarter-size scoop and finger-combed it through my hair. I flipped my head and scrunched my hair with a paper towel and let it air dry. While my hair was air-drying I twisted random curls around my fingers into corkscrews. After waiting eons for my thick hair to dry, I looked in the mirror to find soft, sculpted, curls. The curls I had corkscrewed were smooth and flexible. Add texture and create piecey or out-of-bed looks for all De-Constructed style. Get touchable control and a subtle, satin finish that is non-tacky, not stiff or too coated. Extra Strong Hold. Even though Garnier describes the cream as “extra strong hold,” it didn’t make my hair stiff or crunchy. I honestly this this product would work on almost any hair type… Except of course if you have super thick, coarse locks. Then, it may be a little too much volume and thickness to handle.